In some cases, fraudulent emails might claim to represent Investment Gateway and offer certain benefits. Investment-Gateway.eu does not send any such emails to request information. This website's service is purely informative, and to help direct interested parties to professional corporate services via third party consultants in Cyprus and the European Union. Be aware. Ignore such emails and do not reply. We've done the initial ground-work for aiding company and entity international investments to the EMEA region via Cyprus. Benchmark & compare why Cyprus offers an ideal, practicable & credible location for global professional services. Publications & reports from various reputable industry sources focusing on the economy in Cyprus & the European Union. Follow key macro economic statistics & trends on Cyprus & the EU to aid in professional services & investment decisions. Expanding business abroad – away from your initial area of operations – and to new international markets is a strategic decision for growth and economic development, by creating a bridge to tapping new markets, as well as establishing greater operational efficiency. Private enterprise can thereby achieve a competitive edge and drive true progress. It is not simply about achieving taxation efficiency (tax savings) or any form of tax anonymity, as what the term 'offshore' so commonly is believed to refer to. It is more about choosing an ideal location (abroad) for expanding operations to new markets, as well as making business activities more efficient. It also goes without saying that greater operational efficiency, including tax and professional services savings allows an enterprise to generate greater revenue and re-invest for future growth and progress. It establishes a solid competitive advantage on a global scale, and permits an enterprise to distribute their own earnings exactly where they choose. Indeed, true free-market enterprise does encourage progress and overall benefit to the company/organisation, their home country (i.e. by creating employment and new investments), country chosen for investment (again through employment, investments, and infrastructure development), shareholders, owners, as well as to the wider community. For instance, and as a start, so many new initiatives (i.e. technologies, community involvement, eco and sustainable projects) are driven by private enterprise, or in collaboration between private enterprise and government. Thus, capitalism, socialism, or whatever in between, all have their benefit to the community. Ultimately it is up to each individual, organisation and institution to drive positive productivity. At Investment-Gateway.eu, we hope to motivate this idea and support it by our own accord, such as with our contributions to community and climate friendly projects, and by supporting good business practice. 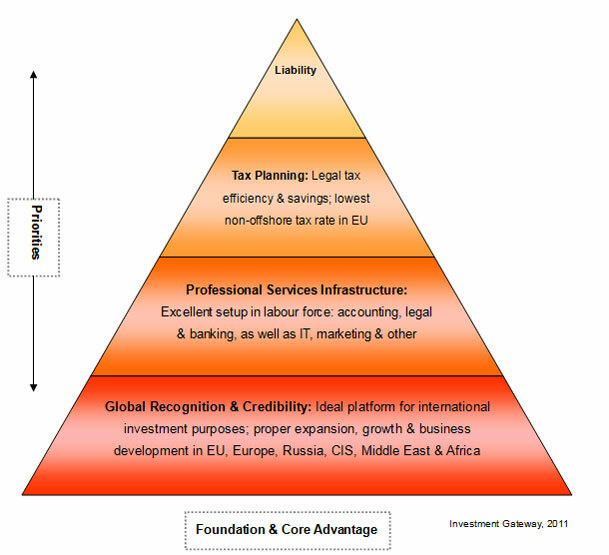 Choosing which jurisdiction to invest your activities obviously depends on many factors, such as location (and in relation to your targeted markets), infrastructure (and in relation to your sector), education level and know-how of the jurisdiction, investment climate, geopolitical and economic environment, as well as support mechanisms, among other. Part of this process also then involves aspects such as professional services, i.e. setting up the company formation and all relevant legal structures, consultations and support, international banking, accounting, and other services. In fact, it is one of the very first steps to ensuring a smooth transition and ultimately successful operation investment. Indeed, the world's economy has fast developed into a global village; interconnected, yet autonomous within sovereign boundaries. Today, each country eagerly attempts to attract foreign investment in an effort to boost their own economic development. They do so by providing unique and attractive grounds for investment, positioning themselves in a way that is both financially and operationally appealing. Cyprus is doing the same, and is fortunately blessed with geographical location, long history in trade and business, as well as its geopolitical ties, such as being a member of the European Union and Eurozone. Clearly, setting up a company investment, i.e. away from you core location of operations has multilayer benefits for growth. As part of these operations, professional services and taxation benefits must also be considered highly. However, we must also make the distinction between a company offshore in a tax haven jurisdiction, and a company offshore in a credible financial centre that encourages greater business interaction and growth. Perhaps in wording there is a fine line, but in reality they are worlds apart. A Company offshore in a credible financial centre: essentially this means setting up a company or branch everywhere else in the world, such as with an International Business Company (IBC). In this situation, a company or individual is seeking a strategic investment move, both for tax planning efficiency, as well as expansion and growth – targeting new markets, domestically in the new country of incorporation or within its greater region. A company here must legally maintain bookkeeping and submit audited and certified accounts, it does not have full anonymity and does have a taxation rate. Because of these critical differences, such jurisdictions are recognised globally as being credible financial centres, in turn open to greater business trade, investment possibilities and monetary transactions. Common jurisdictions that attract a good amount of foreign companies include Cyprus, Hong Kong, Ireland, London, Luxembourg, Malta, the Netherlands, Singapore and Switzerland. Now, since each country in the world is able to have its own unique legal status and taxation rate for companies, adjusted to suit the local market and interior conditions, entities set up in a jurisdiction offshore can also achieve a certain level of taxation efficiency, in other words lower taxation. Thus, when making a strategic move to set up a company investment for expansion and growth, it is much better to be based in an advantageous location where there are also some tax planning benefits. Some companies of course prioritise these tax planning benefits. Other key attributes include good professional services infrastructure and understanding of international company and tax laws, a business-friendly government, low operational costs, and an appropriate geographical location to meet company targets, among other. Few credible jurisdictions offer all these benefits. Who can benefit from establishing a company offshore? Why set up your company/entity in Cyprus. Offshore to Onshore. "Cyprus is poised to become one of the EU's and Europe's wealthiest country following enormous natural gas and petroleum findings. This will surely benefit the local economy through trade, revenue, investments, infrastructure developments and new employment. More importantly for the professional services sector, it will allow the country to maintain its position as the lowest tax jurisdiction in the EU and Europe, and offer Cyprus based companies extra incentives and growth prospects. All companies based in Cyprus will benefit significantly." Cyprus offers an ideal investment climate by creating a bridge to tapping new markets in the EMEA region and fully optimising business operations. To put it simply, Cyprus is an ideal location for tapping into a wider global market, namely the European Union (EU), the rest of Europe, Russia & CIS, Middle East and Africa – EMEA region. Cyprus has geographical, political, cultural and economic ties with such markets, as in doing so, provides the perfect investment bridge. Infrastructure is superlative, labour skills and education levels are far above European and international standards, and the government is extremely business friendly. Beyond this, Cyprus offers the EU's most attractive tax structure, together with an excellent level of professional services, thereby fully optimising operations and company structure. With this, Cyprus has made enormous efforts to clearly distinguish itself from so called 'tax havens', so it is widely seen as a credible jurisdictions and location for foreign investors. Some quick words about Cyprus as a financial centre and jurisdiction for setting up a company to invest in the EU and EMEA region. Operations and tax planning efficiency for investment and growth. Cyprus has clearly made the move from offshore to onshore. For over three decades, Cyprus has been a popular jurisdiction for setting up a company, backed by its low taxation rate and other corporate incentives. A strategic location – at the crossroads of Europe, Asia-Middle East and Africa – pro-business government, and excellent infrastructure for professional services also made Cyprus an ideal location for international investment company formations. Then in 2004, Cyprus became a full member of the European Union (and Eurozone in 2008). This completely changed the dynamics of the professional services industry in the country. As per EU directives and international best practice, no longer would there be any distinction between what was previously known as a Cyprus investment company and a Cyprus local (onshore) company. Essentially, all became the same entity, classified as an International Business Company (IBC) – all became onshore companies. Corporate tax rates increased to the universal 10% (lower for shipping companies) for all local and foreign companies. However in return, EU accession brought added value and credibility to a Cyprus IBC. Many benefits were gained, and overall, Cyprus cemented its position as a leading European and global financial hub. All companies registered in Cyprus became onshore EU companies, enjoying greater trading possibilities with other EU member states. Monetary control restrictions on Cypriot companies were also scrapped, allowing investors to freely transfer funds in and out of the country, i.e. fewer restrictions on the export of company surplus profits. Above all, the upgrading to EU status boosted Cyprus' credibility as a financial centre, in turn increasing possibilities for double tax treaties with other countries both within the EU and abroad. This change motivated even more companies and individuals to register in Cyprus. Today, Cyprus maintains the lowest corporate tax rate in the EU and is the lowest non-investment, non-tax haven tax jurisdiction in the world at 12.5% (0% for shipping companies, 4.25% for maritime management companies). Indeed, a strong incentive and justification to Cyprus' claim as a leading financial centre. To support this, Cyprus has an extensive network of double taxation treaties with over 50 countries, and a further 40 currently being negotiated. Together with a host of other corporate and individual tax planning benefits, an ideal geographical location, a healthy economy and geopolitical stability, as well as excellent infrastructure and grasp of professional services – legal, accounting, banking and administration – Cyprus has fast become one of the world's most popular jurisdictions for setting up an intermediary company. Cyprus, a major investment gateway to the EU and EMEA region. An ideal financial hub. Geographical location, therefore ideal for business relations and communications with most marketed in the EMEA region. Macro economic stability imbedded in services, and in particular financial and professional services. Now, the Cypriot economy has huge prospects for growth and diversification. This will ensure companies based in Cyprus not only continue to enjoy local benefits, but also access some of this great potential. A thorough understanding of accounting, tax and investment strategies, together with a business friendly government, providing the necessary support to make things work. Excellent professional services infrastructure in legal and accounting firms, banking and financial institutions, administrations and company support services. This includes highly educated and multilingual staff, with all business conducted in English, whilst Greek, Arabic, Russian, and other Eastern European languages widely spoken. Chinese (Mandarin) and Hindi are also now a key focus. Since Cyprus' economy heavily revolves around professional services, it has been set up to be efficient and extremely competitive. Low taxation rate. Net profits of Cypriot IBC and foreign company branches managed and controlled from Cyprus are taxed at 12.5%. This makes Cyprus the lowest tax jurisdiction in the EU and the lowest non-investment tax jurisdiction in the World. Double tax treaties. Extensive network of double taxation treaties with other countries – over 50 at present, and a further 40 currently being negotiated – including with all EU countries, Russia, CIS and Eastern Europe, the US, India, China, South Africa, and many other major markets, see full list of which countries has a double taxation treaty with, click here. Other bilateral agreements are also in place to encourage international company activities in Cyprus. Zero tax. No withholding tax on dividend distribution and payments of interest and royalties, whilst profits earned from a permanent establishment abroad are fully exempt from corporation tax. Also, no capital gains tax except upon the sale of immovable property in Cyprus. Group company tax benefits. No time restrictions on carrying forward tax losses from one company to another, as well as group relief for utilisation of tax losses between companies. Shipping company tax. No Tax on profits from the operation or management of a Cyprus-registered vessel, among other benefits for shipping companies. Cyprus is the EU's third largest maritime nation and among the top 10 in the world. Banking and finance. No exchange control restrictions; bank accounts are possible in any and multiple currency, anywhere in the world. Cyprus has a strong banking sector with internationally recognised organisations. Anonymity & liability. Confidentiality and anonymity of the beneficial owners is assured via nominee services; nominee directors, nominee shareholders and nominee secretary. Companies in Cyprus offer international liability.